The biggest tournament in the Southern Hemisphere kicks off tomorrow as the World Champion Springboks take on the mighty All Blacks in the opening game of the 2008 Tri Nations series. It's one plays two as South Africa look to follow on from their World Cup success and retain the number one spot in the world, with New Zealand gunning to topple them in front of a packed Wellington crowd. New Zealand at home will always be the favourites, as is illustrated by South Africa's poor record away from home. If ever the Boks had a chance of beating the AB's in New Zealand though , it's this year, and that's one of the reason's why this years tournament should be a closely fought affair. Some are calling it the biggest Test of the year, and they're not far off considering recent results from the two powerhouses of world rugby. Both sides are rebuilding. South Africa with a new coach and one or two new faces, and New Zealand recovering from the mass exodus after their disappointing result in France. Australia, perhaps the underdogs in this years tournament, are themselves experiencing a fresh start, with a new coach and a new lease on life. They will play France tomorrow as that series comes to an end, before they join the Tri Nations to play South Africa in Perth in three weeks time. 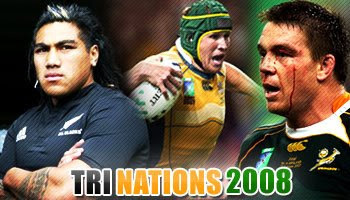 The 2008 Tri Nations promises to dish up another helping of top quality rugby, the kind of rugby we've seen over the past ten years. The prospect of seeing the Springboks, Wallabies and All Blacks do battle until September is something that will surely get rugby fans pulses racing all over the world. This short preview highlights a few great moments from the past, and gives you a slight taste of what's to come. yay first post! i no thats sad but i never got it b4. New Zealand this year boyzz!!! 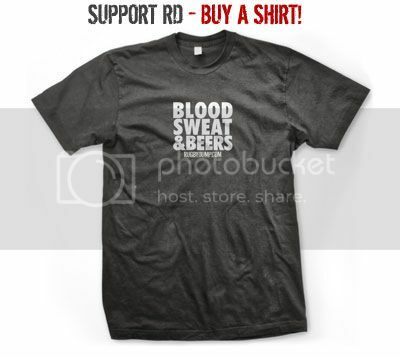 Come on the Wallabies i hope our front row holds up a little better this year lituarly if they do we stand a good stand of winning. That Frank Bunce try is beyond compare. i'm getting used to seeing Joe slip through about 3 or 4 tacklers, he's one strong guy. excellent video...call me nuts as i'm from the northern hemisphere but i hope the springboks do well! That's quite a good song. south africa are gonna breeze it this year, they are quality throughout. there's a few weak links in the backs but overall they are the strongest team by miles. nz are missing far too many experienced players and the line-out is embarrasing. aus just don't have the match-winners. only giteau can really produce magic and i could out scrum their front row on my own. I see it like you felix...with the slight difference of putting Australia in 2nd place. I predict the kapo o pango prematch. The AB's haven't done it all season, perhaps an indication of their opposition, so expect to see it tomorrow as a mark of respect for the Boks. UP THE WALLABIES! I'm looking forward to a good tri-nations this year, should be spectacular. I just hope the wallabies get up for this one! what the hell was that at 1:13 bloody hell! That NZ move, the huge looped pass by the Oz and pretty much everything else, wow. can i change my prediction now? well i can see NZ preforming well yet again in the tri nations! it seems to matter more than the world cup yeh!!??? ha! As I see it, it's off a lineout. 6 and 7 are out of the lineout and start setting up a maul on 13. 13 flips it out the back door to the 10 on a loop. 10 then switches with the open wing (Lomu) headed back inside. Open wing then switches with the blind wing (Umaga?) coming round. Blind wing is then free to set off with 15 (Cullen) in support. uer, that move was off a line out, had a one man lift in it at the front. That move makes you drool just watching it, lomu on the dummy, awesome. Two awesome display of wingers' performance in that video. Habana firing up his jet-propelled legs, and Rokocoko eluding three defenders to score a try with two Springboks in tow. Pretty klass video clip all round!! nice vid i'm thinking NZ have good chances of winning this year, btw whats the song? hope that South African's will show, that they are the best! well, after 2 games, the all blacks and the springboks are even, and australia are due to play next week. personally i think australia could do it this year, matt giteau has evolved into an incredible fly half, and with players like mortlock, tiquiri, barnes and co australia are my firm favourites, their hammering of france gives me more confidence. im english btw so dont think that im biased at all! if anyone thinks im mad please reply! That set play by NZ at 1:14 is amazing! Great video. Video's down, any chance it will be re-uploaded?